Part of the beauty about YA is that there is more diversity to be found on its shelves than one would think. While the typical teenage paranormal romances seem to get all the headlines, a burgeoning (and promising) collection of steampunk and science fiction is rapidly expanding into YA territory. David Weber’s A Beautiful Friendship is one of those books. The Star Kingdom has only recently settled on the rugged frontier world of Sphinx and were still in the process of colonizing the wild planet, and poor Stephanie Harrington has been dragged along with her parents to this new world. Now, dragged might be a misnomer, because young Stephanie is actually quite excited about exploring the untamed and undiscovered wilderness. Her excitement is tempered quickly, however, when her parents (wisely) refuse to let her explore on her own. With the casual finding of loopholes in the household rules (as teenagers are wont to do), she quickly becomes interested in something else entirely when her family’s small garden is raided by an unknown animal. The entire Harrington family is confused, however, because the only thing that was taken seems to be celery. Stephanie begins to try to track down the thief, but it eludes all cameras and lasers — until Stephanie finally figures out how the strange creature is accomplishing this feat. Stephanie lays her trap, and finally catches sight of the most elusive of all creatures on Sphinx — a treecat,; a lean, six legged creature with odd intelligence that Stephanie finds amazing. However, the treecat (Stephanie calls it this; at the time, nobody had even suspected such a creature existed) disappears quickly into the forest, leaving behind one very disappointed girl. Climbs Quickly is a member of the Bright Water Clan, one of the many People which live on Sphinx. The arrival of what his people call the “two legs” has driven all of the clans deeper into the forests, leaving behind scouts to watch the homesteads of their new neighbors. Climbs Quickly, like a few other scouts in the area, has discovered the “stalk”, celery, and is instantly addicted to it. He sneaks into the farm, is discovered by a young two-leg, and flees, though her “mind-glow” (a sort of telepathy/empathy communication between the People) is stuck in his head and he always seems to know where she is at all times. Stephanie, too, seems to know where the mysterious treecat is at all times and, after ditching her gliding lessons, attempts to track him down. However, she crashes her glider far from home and is alone, injured and frightened. Her treecat finds her and they form a mental/emotional “bond”, which allows the treecat to lesson Stephanie’s pain and fear while Climbs Quickly calls to his fellow People to come and help him save her. However, Climbs Quickly discovers that she has crashed near a death fang’s lair (Think puma on steroids here) and knows that time is running out. He has to protect his young two legs before the death fang returns and kills them both. I felt a momentary pang of actual fear during the tense standoff between Climbs Quickly and the death fang, which was very odd, because I already know what was going to happen. And yet… my throat constricted, I got a little misty eyed (my office is dry and dusty, dang it) and felt more than a little relief upon the conclusion of the encounter. David Weber’s Honor Harrington series is one of the best-selling science fiction series out there, yet it pales in comparison to this novel. Setting hard science aside and focusing more on the compelling plot and character development, the author actually betters the story and makes this a far better read than a traditional scifi novel. 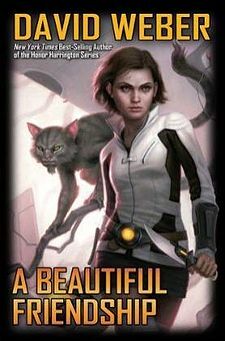 His pacing, world building and plot are all fabulous, and while the reader gets to feel the emotion of the bonding between two species, one also gets to look in from the outside to see just what is going to happen next. A simply amazing book about bravery, trust, loyalty and friendship, A Beautiful Friendship is very near the top of my YA books of the year. A definite must-read for everyone, whether they enjoy pure scifi or YA. This entry was posted on November 21, 2012, 1:54 pm and is filed under Book Review. You can follow any responses to this entry through RSS 2.0. You can leave a response, or trackback from your own site.